We aim to build grassroot network across the globe and leverage the power of teams. Situated in the university town of Cambridge — the breeding ground of research and innovation, Cambridge Hub is an international group combining a diverse combination of skills and interests encompassing: sustainable energy; biotechnology; education; information and artificial intelligence; public health; existential risk; gender diversity; business; entrepreneurship; and diplomacy. In addition to a vibrant group of active members, we are building a network of ambassadors, a board of advisers and an international alumni network as our members move on but continue to support the hub. Hello, World! Namaste/Salaam/Satsriakaal. I’m Arushi, a scientist and engineer from India, currently pursuing a PhD in Statistical Computing + Medicine at the University of Cambridge. When not building machine learning models for anti-cancer and anti-microbial therapies, I can be found dabbling in philosophy. I am passionate about the welfare of present+future sentient life, data-driven sustainability, equal access, and AI ethics. I enjoy eating extremely (90%+) dark chocolate, attempting to learn ALL the things, and exploring my mind through mindfulness! As a Global Shaper at the Cambridge Hub, I am involved with initiatives spanning climate change, mental health, and 4IR. My name is Charlotte and I am originally from Germany. I am currently finishing my PhD on rapid risk assessment for communicable diseases in humanitarian emergencies with the Health Protection Research Unit in Emergency Preparedness and Response. I am also a pro bono advisor for the InterEuropean Human Aid Association. Beyond my obvious love for all things epidemiology and infectious diseases, I like to travel and explore new ground, scientifically, culturally, and geographically. I am also a budding rower. As a Global Shaper, I have spent my first few months in the Cambridge Hub involved in giving talks about the link between Climate Change and health and in promoting the importance of mental health. Hi my name is Daniel and I’m from a small village in Southern Bavaria, Germany. I was passionate about skateboarding and parkour when I was in high school. Later on, I discovered my passion for tech and entrepreneurship and soon founded my first venture which was measuring emotional intelligence. I’ve also established Unlimitix (www.unlimitix.com) which aims at empowering individuals to achieve their goals by understanding their body and their brain scientifically. Furthermore, I’ve launched www.ewor.org to allow people to found ventures in a risk-mitigated environment and www.kairossummit.eu to bring people together that want to tackle the world’s greatest challenges by means of entrepreneurship. I’m a new shaper and look forward to engaging in my first project soon, which is likely going to be Shaping Horizons. Hi, my name is Diana. Originating from Moldova, I have studied and worked across Europe over the last 10 years. Following my degree in Political Sciences, from University of Milan, and working with the Youth Council in my home city of Chisinau, I have found a new passion in marketing behavioural analysis and have implemented creative ideas for a number of sectors in online advertising. Now working in the educational sector with Cambridge Assessment English, I am helping to deliver digital products to end users across the globe through the channel of international events. I have always had a passion for volunteering and have been involved with NGOs in Italy, Spain, Russia and, now, here in the UK with the Global Shapers Cambridge. I’m Joey Wilson — a native of South Carolina in the United States. Coming from a small town of 2,500 people, I’ve always sought out opportunities to explore our world, understand it better, and change it. I earned a B.S. in Bioengineering from Clemson University and an MSc in Global Affairs from Tsinghua University in Beijing, China as a Schwarzman Scholar. Now I’m pursuing a Ph.D. at the University of Cambridge, where I do cancer research centered around drug discovery, development, and testing. In the past, I served as Clemson’s Student Body President and worked with Vice President Joe Biden on a national initiative to address sexual assault on college campus and try to advocate for survivors. I recently joined Global Shapers, but have sought to have a role in recruitment and plan to get involved in the awesome and inspiring projects with social impact. Hola! I am Juan Sebastián Cañavera Herrera and I am a Colombian civil engineer currently doing a PhD at the University of Cambridge. In my research, I am looking into how to understand and improve climate change adaptation planning for urban road infrastructure. I am very passionate about interdisciplinary research and bridging the gap between engineering and social sciences, and in my free time, I am very passionate about many things geek, especially video games and science fiction. I’m currently one of the officers of the “Humans and Nature” theme of an event promoted by the Cambridge Hub called Shaping Horizons, where I’m in charge of creating the space to discuss adaptation to climate change and its importance for the future of Latin America and the UK. Hi, my name is Lukas and I’ve started my PhD in Economics at Cambridge last year. My research lies at the intersection of macroeconomic policy, inequality and automation. Passionate about science communication, in my free time I also write a blog on economics and public policy and debate these topics on Twitter. Originally from Germany, after spending a year volunteering for a children’s charity in Thailand, I’ve pursued university studies and work in the UK for the past couple of years — but somehow managed to still love coffee and chocolate a great deal more than tea and scones. As a Global Shaper, part of the Cambridge Hub, I am part of the team behind Shaping Horizons 2019, where I am Co-Director of the 4th Industrial Revolution Theme. My name is Matias and I am from Argentina. In the last eight years, I have worked in Germany, Switzerland, Japan and the UK doing research on functional materials. Currently, I am a postdoctoral fellow at the University of Cambridge, where I do materials for sensors and fuel cells to transform hydrogen to clean electricity. I am quite passionate about building disciplinary, cultural and generational bridges for an inclusive and sustainable future and advocate for scientists policies, organize science-educational activities, and several initiatives at the interface between science, policymaking and diplomacy. I love food and playing the ukulele. I need to improve my ukulele skills, but I am confident with cooking ones. As Global Shaper, I give educational talks, took part in shapers4climate, and run Shaping Horizons. Currently, I am also the Curator of the Hub and, hence, overview its functioning. Hi, my name is Michal and I graduated from University College London with a MPharm degree and from the University of Cambridge with a PhD in Biological sciences, where I studied biophysical effects of antibiotics on the bacterial cell. With my background and interest in pharmaceutical sciences, currently I lead CamIn’s Life Sciences division. There, I drive business development and sales to identify, evaluate, and integrate emerging technologies, valuable assets, and high growth applications to strategically strengthen his clients’ portfolios. As a Global Shaper, part of the Cambridge Hub (UK), I am part of the team behind the Shaping Horizons 2019 Summit, where I help with sponsorship activities. Hi, I’m Miruna, born and raised in Romania but then studied in London, Rome and Cambridge and travelled to more than 30 countries. I am currently leading VC and Strategic Partnerships efforts at SyndicateRoom, a Cambridge-based online investment platform and fund with over 120 startups in its portfolio. I’m also mentoring startups and covering venture capital and the wider startup ecosystem on Forbes.com. I love people with big visions for the future and the drive to make it all happen. I also love good books, world cinema and chocolate. As a Global Shaper, part of the Cambridge Hub, I’m in charge of recruitment and membership. Hi! I am Nora, from Paris. I am an analyst specialising in European and Russian geopolitics. I believe that in this time of existential challenge to our governance system it is essential to overcome divides between communities and develop a new, unifying vision of what we aspire our societies to look like in 20, 50, 100 years. My work at Global Shapers is part of making this vision happen. Currently, I am Director for Sponsorship at Shaping Horizons, a science diplomacy initiative between the UK and Latin America launched by our Cambridge Hub. A fundamental aim of this project is to trigger new forms of collaboration between both sides of the Atlantic. My name is Philipp and I am working on my PhD in Theoretical Physics and Machine Learning at the University of Cambridge. I am originally from Germany and have lived in the UK for 3 years. I am a scientist at the heart, but generally passionate about politics and decision-making processes. Outside of my academic career I am a co-director of the Sortition Foundation, and as such I try help set up Citizens’ Assemblies for local authorities in the UK and more generally promote the use of Sortition in democracy. As part of the GlobalShapers Hub in Cambridge, I am involved with the development of the RandomShaper platform. I am Poorvi and I grew up in India and moved to the UK early last year. Currently, I work as the Voice User Experience Researcher at the Alexa Speech Group at Amazon, UK. I am working towards making AI more human. With my background in human-centered design, I believe that design has a crucial role to play in the society ranging from social innovation to business intelligence. I am passionate about working at the intersection on design, tech and business. As part of the Global Shapers, I am running a project “VOICES” to address gender imbalance in public speaking and helped run other campaigns on climate change and mental health. I am currently serving as the interim vice-curator of the hub and served as the secretary prior to it. Hi, my name is Simon Egelke. I am a PhD candidate at the University of Cambridge focussed on advanced battery electrode structures and the Cambridge University Entrepreneurs (CUE) Entrepreneur of the Year 2015. Previously, I was a Research Affiliate at the Lawrence Berkeley National Laboratory and part of the Materials Project, a collaboration between LBNL and MIT. I have been entrepreneurial from a young age, starting in Berlin with art (www.fayst.de) and consulting (www.hipotentials.com) to publishing in the Netherlands (www.Storage4.eu). In the Cambridge Hub I started RandomShaper (www.randomshaper) to connect Global Shapers from over 180 Hubs (>100 countries) in serendipitous ways. I have a great passion for energy storage and the fusion of disciplines, especially science, business and politics. Hello, my name is Takashi and I grew up in Maidenhead, UK. Currently, I am a first year PhD student at the University of Cambridge, undertaking a cross-disciplinary project into photocatalysts and techniques we can use to screen them rapidly. I am primarily interested in those that can produce solar fuels such as hydrogen cheaply. When I am not in the lab, you can usually find me rowing up and down the River Cam. Being passionate about widening access to higher education, I have been involved with UNIQ, Oxford Pathways and the Sutton Trust. Now, I am involved with a global charity in this area, Project Access, where I manage the UK accounts. 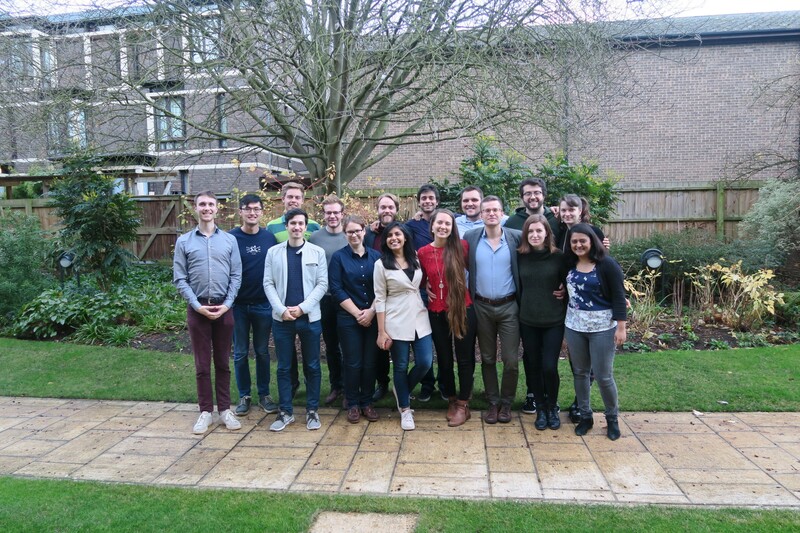 Recently joining the Cambridge Hub, I hope to increase awareness and promote action on sustainable energy initiatives, and to be an advocate of social mobility. Hej! I’m Theo, a Danish PhD Candidate in Quantum Computing at the University of Cambridge who, before landing in the UK, studied in Copenhagen, Munich, Boston and Berkeley. My PhD focuses on writing and reading quantum information in spin-based silicon quantum bits (qubits). Besides my PhD, I am passionate solving pressing problems by intersecting entrepreneurship with the latest advances in technology and research. As a Global Shaper, I co-founded and run Shaping Horizons, a science diplomacy initiative that uses science and technology as a pathway for improving diplomatic relations and political conversation between different geographical regions. Shaping Horizons is officially backed by the University of Cambridge and will unite 250 future and senior leaders to Cambridge in September. I’m Zsofia from Hungary, I studied Social and Developmental Psychology in the University of Cambridge and am currently pursuing my PhD in King’s College London. I am also a visiting researcher in the Winton Centre for Risk and Evidence Communication in Cambridge. As part of my research, I am investigating the intersection of mental health, poverty and power imbalances in global health decision making with fieldwork taking place in Ethiopia, Argentina, India and Hungary. You can also read my blog on cultural psychology, international development and travelling. As a Global Shaper I’m involved in an inter-hub project called Voices, aiming to empower women from various fields to engage in public speech and dissemination of work. I am also involved in a new initiative on mental health. Interested in collaborating with the Cambridge Hub and growing your impact in the world?